If you need some basic/straightforward forms, such as quizzes, surveys, or other form input, Google Forms will likely serve your needs 95% of the time. If you need a feature-rich, complicated form solution, you'll likely need to build something in-house or purchase off the shelf. Also: plenty of companies would prefer to have something that can be completely customized and not have the distinct look of a Google Form, from a branding point of view. But for small organizations that aren't bothered by the look of Google Forms, don't care if people recognize it as a Google Form, or if for the organization that needs an economical option, Google Forms is a great solution. 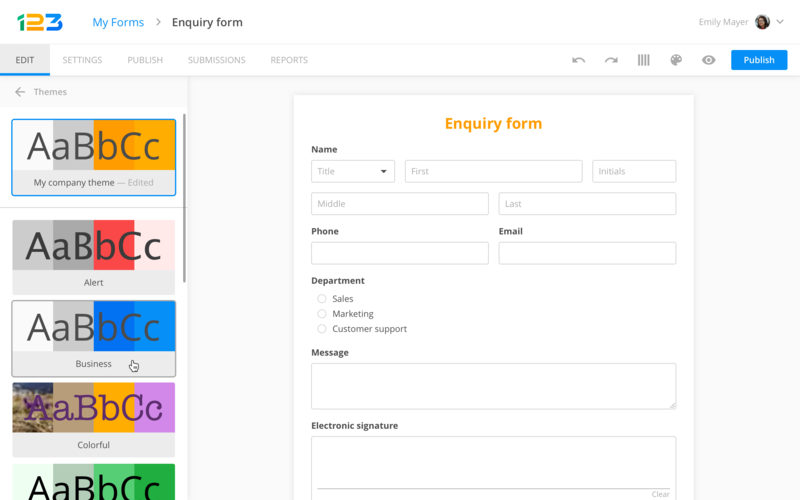 Easy to use interface makes creating and deploying forms easy. Any user with average computer knowledge can create forms and deploy it. The wizard is simple to use. A What-You-See-Is-What-You-Get interface makes it easy to drag and drop form elements and organizing them based on actions or events. The forms are integrated with Google Sheets which gives a spreadsheet view of the data collected, making it easy to analyze. The type of data that can be inserted into a field can be customized based on regular expressions for advanced users. This gives the ability to customize the form even further. The design customization for the form is very limited. If the users could change the design to make it look for formal, then it can be used for more purposes. If the forms provide APIs for the data, then the developers will be able to collect and analyze the data even faster. Sometimes developers tend to like more dynamic interfaces. For example, instead of the WYSIWYG interface, if there was a way to build these forms themselves using HTML or other languages, then it gives users more control over their forms. It simply works and delivers the results needed with a simple and intuitive interface. Google Forms allow unlimited questions and responses without any cost, whereas SurveyMonkey requires payment based on the audience and questions. It was easier to use Google Forms compared to SurveyMonkey, as it had a very easy to use interface. Moreover, the fact that Google Forms is used by many people makes it something that everyone is familiar with. Easy to install and track conversions, which has helped prove conversions to clients. Saves time in person-direct sessions or interviews. Provide mass distribution in simple electronic mediums. Customization and branding reflects in a more personal experience for the donor.